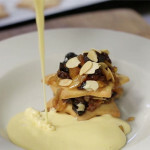 I am delighted to be sharing this recipe for mince pies with a twist from Carluccio’s chef Luciano. If you try this Carluccio’s Lasagnetta Mince Pies please tag #FussFreeFlavours on Instagram or Twitter. It is amazing for me when for me when you make one of my recipes and I really do love to see them. You can also share it on my Facebook page. Please pin this recipe to Pinterest too! Thanks for reading Fuss Free Flavours! Roll the pastry until about 3mm thck, cut out stars using a star cutter. Place in the Whisk the egg oven on a pre-heated tray lined with baking paper, or until golden. Whisk the egg yolks, caster sugar and wine in a bowl and cook over a bain marie until it thickens to a custard like consistency.